everything above zero degrees is fine at idle and load!!! example: CPU-Z 5198.7MHz, but monitoring tool reads out: 5203.4 MHz, which is a no go!!!! Seems there is inconsistency in the rules again. What about the OS? The standard rules does not apply here? I saw a lot of Win8+ submission. Is it possible to show all of the rules on the competition page? Trolling through the forum to find what is OK and isn't is hard enough for the veterans here sometimes, for newcomers, they would have no idea what is going on. This might help those that have no clue gain a bit of a clue before running and failing to submit. Looking forward to having a bit of a crack at one of the rounds, not sure which one yet. If Leeg doesn't get around to it before me I'll have a look later and try to update comp pages. The rules are on the actual stage pages open the division you want click on the stage then click on "go to stage" under the scores already submitted seems simple enough to me. I don't know if anyone has found this solution yet but here it is. For HWmonitor Pro, there was a problem with it not detecting a different CPU if you wanted to swap CPUs for example to try something different, it always shows the CPU the program was initially installed with. While the program doesn't automatically update what it's detecting hardware-wise you can make the program do this without having to reinstall anything. At the top of the program's dialogue box once the program is running you'll see options such as "File", "View", "Network", ect..... go into the "View" option and you will see a function called "Clear Labels". Click that and let the program do what it has to and it will then show the correct hardware in use. You'll have to do this each time you swap hardware to make it show the correct hardware labels but that's how it works. i dunno what the classic page means, but i do suggest this, if all the rules were put on the main page of the comp thats being run then no one has any reason not to know what the comp rules are . if theres any changes in rules for what ever reason the management of the comp decides for it at the time to benefit the comp then so be it....that gets put on the main page in the RULES of whatever change has been decided on for what ever reason. main page ...rules , theres no arguments of the rules...simple , i dont see anything more simple and functional actually? Read this thread and you'll understand where this is coming from. The issue is with the trial (Unpaid) version of HWmonitor Pro, not the regular (Free) version of HWmonitor. Could be the Pro version once activated (Paid for) will work like the other, no need to worry about it but since most here are using the Pro/Trial version for the comp only it's a "Thing" and that's what I found to resolve this problem. Honestly I woudn't pay for a proggy to only use it for a single comp, doesn't make sense to. I've also discovered the deal with "Trial" appearing sometimes with the sensor readout for things like CPU temps can be resolved by simply closing and restarting the program, it seem to be random in what it chooses to do that with. May have to do it once or twice but it will eventually show the actual readout from that sensor as it should for a valid sub. Regardless, both will work or can be made to if need be as long as it's legal for the comp. To clarify, platform timer can be disabled on W8/8.1 and 10? Two lines conflict each other??? or is it ok off for W8/8/1/10 but not Server 2012??? 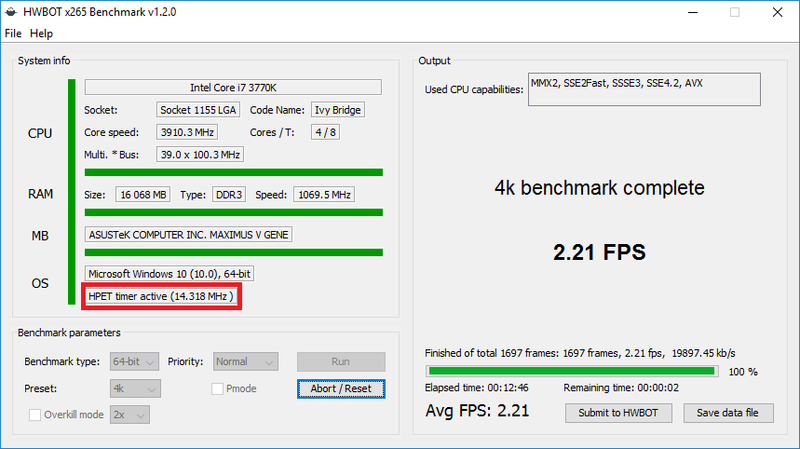 Skylake and newer Intel CPUs do not need to have the timer enabled as they are RTC bug free. However we have seen some "bugged" subs with an error (regarding HPET timer) in X265. (with a Coffeelake CPU and a Server OS). The creator of X265 says there is sometimes a detection issue with some server OSses ( probably due to lite versions ) and it is recommended in case X265 gives an error to enable the HPET timer and re-run. Thx mods for the first round, congrats to all. It was hard but whit a lot of fun.